Heavy rain in parts of Texas has led to flash flood watches for some of the state's largest metropolitan areas. The National Weather Service has issued a flash flood watch for the Dallas-Fort Worth, Austin, San Antonio and Houston areas. 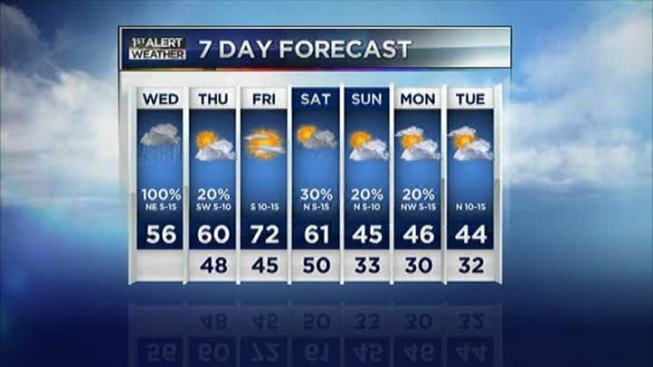 The flash flood watch in effect for the DFW area is set to expire Wednesday afternoon. Storms pushed into North Texas Tuesday afternoon and since that time Oncor crews have worked to restore power to roughly 1,700 customers, most of which are in the Dallas area. Heavy rain in parts of South Texas has led to the closure of about two dozen roads in San Antonio due to high water. Forecasters say San Antonio received nearly 3 inches of rain overnight. The Austin area recorded almost 2 inches of precipitation since Tuesday morning. CPS Energy reported scattered electrical outages in San Antonio.